for creating places, defining space, creating visual interest, and promoting pedestrianism in Willingboro, NJ. Willingboro, New Jersey is no stranger to development projects on a grand scale. It was here, in 1956, along the right bank of the Delaware River, that American builder William J. Levitt located one of his famous, and enormous, single-family suburban communities. Before the arrival of Levitt, Willingboro was a quiet, rural outpost with fewer than 900 residents, tenuously connected to Trenton and Philadelphia by Route 130. By 1959, its population had exploded to more than 10,000, and that figure would quadruple by the end of the 1960s, as families, lured by the auto-friendly shopping centers and drive-ins along the strip highway, relocated from Camden and Philadelphia to New Jersey’s own version of Levittown. But if dependence on the automobile and automotive culture built Willingboro, that same dependence generated weaknesses as well. The increasing prominence of the New Jersey Turnpike, coupled with the extension of Interstate 295, led to diminished traffic on Route 130, and Willingboro became a municipality frequently bypassed. Once the quintessential New Jersey strip highway, Route 130 is today a thoroughfare in transition ñ many substantial lots once devoted to retail superstores and shopping malls have been abandoned, victims of the notorious fickleness of traffic patterns. The enormity of these fallow lots has deterred redevelopment efforts, as many prospective builders, daunted by the sheer acreage involved, have struggled to imagine how these properties could be reinvented to suit modern commercial and residential tastes. Robert Stang and ReNEWal Realty were not so easily intimidated. While some perceived Willingboro as a municipality in decline, Newark-based ReNEWal, a progressive real estate firm dedicated to acquiring, remediating, and redeveloping brownfields sites, saw a township strategically located between Trenton and Philadelphia, a place served by many major highways and a proposed new connection between Route 130 and the Turnpike, a freight rail line, and three bridges across the Delaware River. Partnering with the municipality and North American Securities Co., ReNEWal purchased the 56-acre site of the defunct Willingboro Plaza at the crucial (and highly symbolic) intersection of the strip highway and the Levitt Parkway. Their goal: to manufacture a pedestrian-friendly town center, seamlessly integrated into the township, but constructed in accordance with principles of sustainable and balanced growth. While the conversion of an exanimate shopping mall into a postmodern downtown may sound superficially like a visionary’s project, circumstances conspired to ground the endeavor in firm practicality and advantageousness. 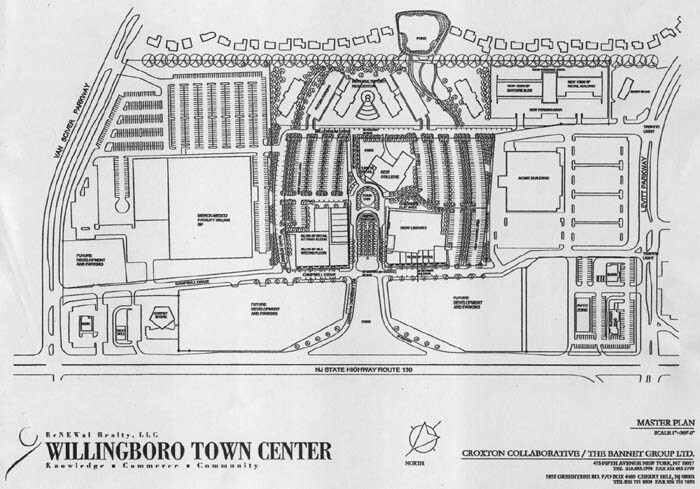 During the heyday of Levitt, the Willingboro Plaza had been a commercial focus for the region ñ and the closing of the Plaza and departure of Sears, Woolworth’s, Fox Movie Theatres, and other retailers left 400,000 square feet of unused space in big-box structures that remained architecturally sound. The prior owners of the Plaza property defaulted in the early 1980s, and Morgan Stanley had been forced to foreclose; while the financiers attempted to create a redevelopment solution for the property, they were ultimately unable to piece together a proposal. A student of American architect and engineer R. Buckminster Fuller, Robert Stang’s master plan for Willingboro shares his mentor’s sense of balance, fairness, and graceful egalitarian design. 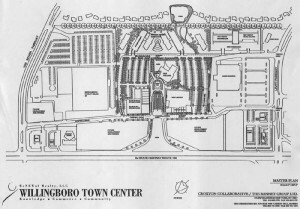 The mixed-use town center will feature national retailers, multistory residential construction, a new library and extension of the Burlington County College campus, and ample parking, but it is perhaps more notable for its fountains, trees, and open plazas ñ those significant green spaces meant for public use and interpersonal interaction. Together with the Croxton Collaborative architectural firm, the environmentally conscious ReNEWal team has pledged to design buildings for maximum energy efficiency, water conservation, and recycling, and to build with materials that have been manufactured with the lowest possible impact on natural resources. The library, college, and retail buildings face toward a proposed park and children’s play area, a town common and a grassy amphitheatre; all offset slightly from the traffic of Route 130, but still within easy walking distance of the main parallel road. The town center has been designed to be thoroughly accessible to pedestrians and public transit, thereby loosening the grip of automobile dependence that has choked Willingboro’s vitality. The Plaza redevelopment project has been greatly assisted by Merck-Medco, which, encouraged by the Willingboro municipal government, has taken advantage of the Route 130 revolving loan program by retrofitting the 200,000 square-foot former Woolworth’s building for use as a drug distribution mail-order facility. ReNEWal contracted with Merck-Medco to redesign the exterior of the building ñ by the time the project is done, the total investment made by the pharmaceutical giant is expected to be more than $60 million. Projections suggest that the corporation will hire 800 employees to work in the new facility. Pleased by this manifest investment in the municipality’s future, Willingboro Township and ReNEWal Realty is currently transferring the 17-acre portion of the 56-acre Plaza site to Merck-Medco.